The Hotel Mosaic Central is a brand new budget 1 star hotel accommodation in the centre of Rome with great transport links and within walking distance of many of the main tourist attractions. The Hotel Mosaic Central has only recently opened and offers 10 modern and chic designer rooms with fantastic facilities and complimentary breakfast. Air conditioning and free Wi-Fi internet access are standard. 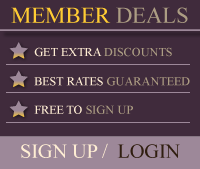 Take a look at our Rooms & Services page for more information. The major shopping streets of Via Nazionale and Via del Corso are within walking distance in addition to the exclusive designer boutiques surrounding the famous Spanish Steps. Come home with bargains and the latest Italian fashion to impress all of your friends. 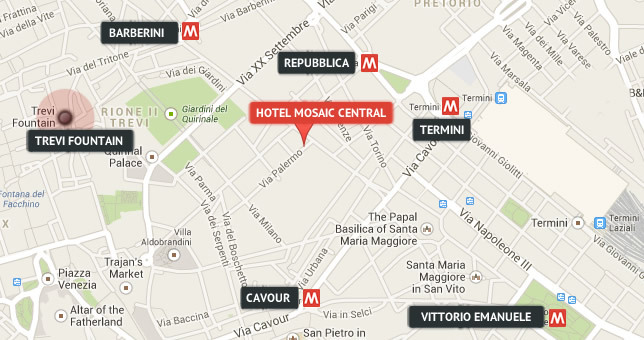 The Hotel Mosaic Central Rome is positioned in the centre of Rome next to Termini Station – the transport hub of the Eternal City. This means that guests can catch the underground Metro system to every major tourist attractions in addition to buses, taxis, trams and rail links. The Hotel Mosaic Central is also within walking distance of the Opera House, the major shopping street of Via Nazionale, the gorgeous Trevi Fountain and even the Coliseum. Take a look at our Location page for more information.